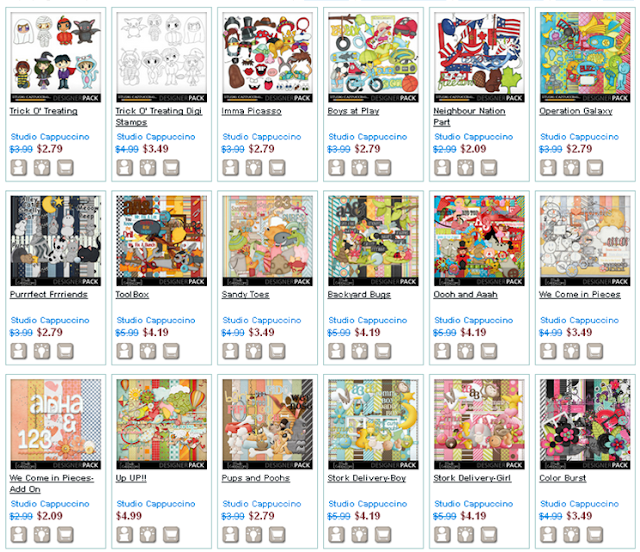 MyMemories Blog: Meet this week's *Featured Designer* - it's Studio Cappuccino! Meet this week's *Featured Designer* - it's Studio Cappuccino! at MyMemories.com - zip on over there and check them out! My name is Tamara, I'm 30...ish, and I'm an army wife living in the Netherlands. We have 2 little furballs Stitch and Michiko. I just can's sit long behind my computer anymore. And with doodling I can use my expensive materials a lot more. My style is I think cute, cartoonish, fun and colorful. I like to throw different materials on my paper like markers, pencil, paint, watercolors, and see where it will take me. Can be great! Can be a mess too, but I loooove getting messy and dirty hands. I love the whole process of doodling on paper to make it a digital item, although if I can skip the cleaning ups after scanning, I would definitely do that! It takes a tremendous amount of time to clean up, but it's satisfying too, seeing them come to life. The WHOLE SHOP will be on sale during her feature week and she'll be giving away FIVE $15.00 shopping trips to her shop as prizes! Always be sure to check out the Designers' FB pages and blogs too - they often preview goodies and hold special giveaways on their own pages, and you don't want to miss a thing! AND HERE ARE THE WINNER's FROM LAST WEEK's great Giveaways from A-Manda! If you are: Monica, Katie Jo, Creative Expressions, or Courtney Jennifer - you have each won a free copy of "S'mores" kit from Amanda! And if you are Jenleon or Yvettevy you have each won a $100.00 shopping spree to Amanda's shop! Please send me an email to get the information you need to claim your prize!! Thank you so much for this post. I want to let you know that I posted a link to your blog in CBH Digital Scrapbooking Freebies (please, notice the new url for my blog), under the Page 3 post on Aug. 13, 2012. Thanks again. Love her artwork! Sandy Toes is my favorite! thanks for the chance to win! Love all your kits. They are all amazing. The one that caught my eye is Color Burst. Love bright colors. Your stuff is so cute!!! Thanks for the chance to win!!! Congratulations Tamara on being designer of the week! Love your work! Love Studio Cappuccino! I am so gonna hafta get the Color Burst kit. You do a really awesome job! I love all of your kits and I can't wait to use them for my daughters photos. Thanks again for a chance to win! I Just Love Your Up Up! & Color Burst!